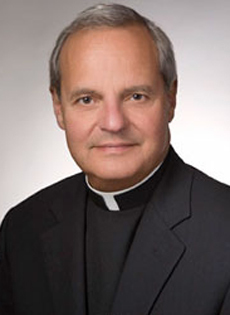 The following is excerpted from remarks made by Msgr. Franklyn Casale at the closing of an international forum on human trafficking, held in Rome May 18 and co-sponsored by St. Thomas University and the U.S. Embassy to the Holy See. The topic of the forum was “Building Bridges of Freedom: Public-Private Partnerships to End Modern Day Slavery.” Miguel Diaz, U.S. ambassador to the Holy See, internationally recognized theologian and a St. Thomas University alumnus, initiated the conference with welcoming remarks. Roza Pati, executive director of St. Thomas’ Intercultural Human Rights Program, acted as panel moderator and provided her valuable insights. Conference participants discussed the role of both public and private sectors in stopping human trafficking and modern-day slavery, including the role of faith-based organizations, corporations and civil society. When I first became involved with the issue of human trafficking some years ago, I was struck by a story that I read about the hymn, “Amazing Grace.” Considered by some the most popular and often-sung hymn in the English-speaking world, it was written by John Newton, a slave trader in his early years. One starry night while crossing the Atlantic, he was thinking about the people in the bowels of the boat who would be sold into slavery. He suddenly realized how heinous his deeds were in God’s sight. That night he had a personal conversion. It was he who later urged William Wilburforce to enter the Parliament to fight to abolish slavery in Great Britain. In 1807, Wilburforce was successful in stopping slavery in Great Britain and the British colonies — an amazing grace! But the paradox remains: Human trafficking is officially abolished in all global communities — and yet the numbers of reported victims of modern-day slavery are steadily increasing. There are an estimated 700-800,000 persons trafficked annually across international borders with 30 million victims worldwide at any given time. The majority of trafficking victims are generally within the 18-24 age bracket, with over one million children trafficked annually. For the past 10 years, anti-trafficking stakeholders have presented different approaches to combat this phenomenon. One key approach, relatively new, has been the utilization of the 3P paradigm of prevention, (criminal) prosecution, and (victim) protection. But because the detected incidences of modern-day slavery are increasing, it is clear that more is needed. The fact is that modern-day slavery is an extremely lucrative business endeavor. We need to recognize the apparent irresistible financial lure for traffickers and craft like-minded, business-oriented, anti-trafficking policies. Second, we as institutions of higher learning, advocates, governments, government officials, corporations, need to heavily invest in the business of the struggle against modern-day slavery. Some of us readily invest in new technology, risky stock portfolios, and innovative business concepts; let us now invest in ourselves, and our neighbors – in promoting the dignity of the human person. The role of universities is crucial. Within the United States, and on international levels, institutions of higher learning serve as incubators, think tanks, research institutions, and clinics for faculty, students, and neighboring communities. Quite frequently, academic institutions serve as the initial learning and informational portals on topical issues. Partnerships can exist in a number of venues and cross-disciplines within academia. Accordingly, since modern-day slavery is one of the human rights concerns of our day, higher education institutions have and must continue to develop curricula and modules focused on educating their students on modern-day slavery – its roots, causes, and solutions. St. Thomas University has been a pioneer in this struggle. Over 250 law students and others work directly with issues of migration, servitude and abuse. For example, our Human Rights Institute, founded in 1992, processes over 6,000 Haitian and Cuban migrants every year. Most of our 11 law school clinics have a thrust geared to the underserved, thereby giving future lawyers practical experience in helping to reduce the burdens of people who normally do not have access to good lawyers. The School of Law has adopted a holistic approach to human rights issues as these violations intersect many legal and social constructs. St. Thoms is committed to environmental study and recently instituted an LL.M. in Environmental Sustainability. It was for this reason that we created our Center for Global Justice and Dialogue. This building will be an integral part of the St. Thomas University School of Law and an important resource serving our law students, the South Florida community, the nation, and the world. The center will house three programs that advance St. Thomas University’s commitment to social justice: The Institute for Law and Public Service; The Institute for Intercultural and Sustainability Research; and our world-renowned Graduate Programs in Intercultural Human Rights and Environmental Sustainability. Through its research mission, the Center for Global Justice and Dialogue will provide a forum for rigorous problem- and policy-oriented analysis of issues of global and national significance. Designed primarily to be an academic think tank, it will identify, study and develop solutions to pressing issues facing the planet. I personally commit the participants in the Center for Global Justice and Dialogue to continue to work on the issue of human trafficking. Using our trove of data and the scholarship of our talented faculty, involving our students, and gathering world leaders at the center, we will continue to be a force in this area and others plaguing the global community. It is still a long road but we are on the right track.